The YS1310 Indicator with Alarms is an input indicator that has alarms with two inputs. Two loops can be displayed simultaneously. 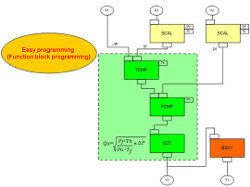 A high limit alarm, low limit alarm, high-high limit alarm, and low-low limit alarm can be generated for each of the two inputs, and the AND connection or OR connection of arbitrary alarms can be output from a total of 6 contacts. 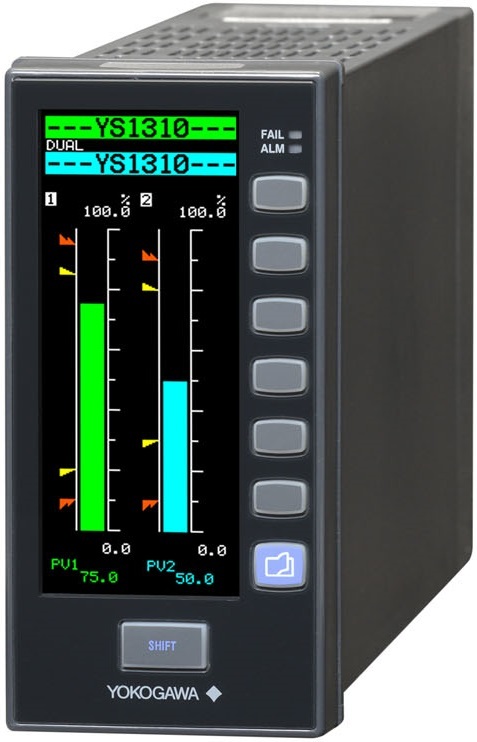 The YS1310 offers high reliability thanks to Yokogawa's proprietary technology, user friendliness, and expandability. The basic type conforming to the DIN short case size contributes to space saving for mounting, and complies with standards (CE and FM). For easy replacement of earlier models requiring the same panel cutout dimensions and depth as those of earlier models are also offered. A full-dot color LCD Clear visibility of the display screen is ensured even in direct sunlight in the early morning and late afternoon. The user can freely access a desired operation screen from meter, trend, bar graph, alarm, and event displays. All parameters can be set via the front panel display. The parameters can all be set by operation on the front panel (no need to draw out the internal unit). Parameters can also be set using YSS1000 Setting Software available separately. No battery or capacitor is used for memory backup. No maintenance is required because batteries and backup capacitors are not used. Compatibility with the YS100 series Setting and control operations can be done with the same feel. In the case of the basic type, terminal-to-terminal pitches differ but the signal-to-terminal arrangement is almost the same. The following functions are included to ensure compatibility with the SIHK. Meter Display was added to the Operation Display. When connecting via RS485 or Ethernet, a communication option is required on the main unit. Passwords can be assigned to user programs to prevent unauthorized access to proprietary programs. A password on the main unit prevents unexpected changes in the engineering parameters. Compact, lightweight design allows the use of smaller and less expensive panel. Moreover, it allows attachment to doors which was previously difficult. Nonvolatile memory is used for memory backup. Service life is improved because no batteries, backup capacitors, or other components are used. The AC/DC (100 V /24 V ) power supply powers the instrument to provide consistent performance.Also accepts DC power regardless of polarity (specify 220 V power supply when ordering). 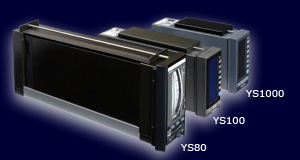 The YS1000 series achieves higher performance than previous models (YS100 series). The instrument can be easily connected to DAQWORX, SMARTDAC+, general-purpose SCADA, and OPC servers via Ethernet (Modbus/TCP). Ethernet : Available to the YS1000 basic type. Modbus/TCP server function (one connection). Connections are enabled using the FA-M3' s UT link module and the RS485 communication function. No programming is necessary to exchange data between the instrument and the FA-M3. The YS1000 can also be connected to PLCs of various manufacturers via the Modbus communication protocol. 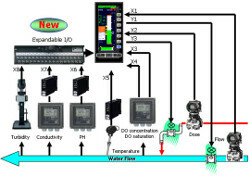 As with previous models, communication with Yokogawa's DCS (CENTUM) is supported. This is ideal for DCS backup in chemical plants and other applications requiring extreamly high reliability.